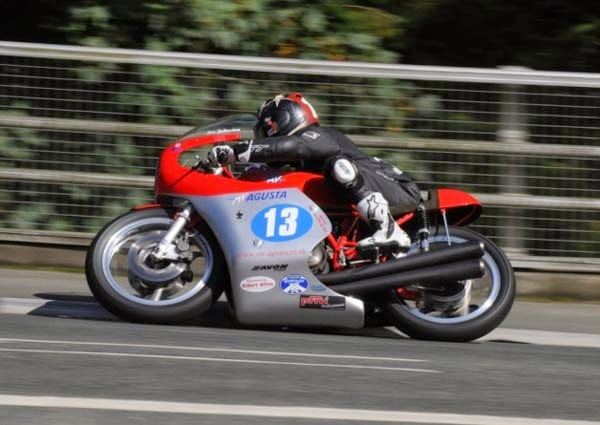 After 31 years of work, dreams and many failures, our statement to Jim Reynolds journalist in 1983 after my MV was stolen in Italy never to be seen again, "Some day I will build a MV GP winning machine and win an Isle of Man TT"
This was achieved in August 2014 by rider Lee Johnston on Mark Kay's constructed race mv in the 350 classic TT, taking the win and archiving the new lap record for the class of 105.239mph. 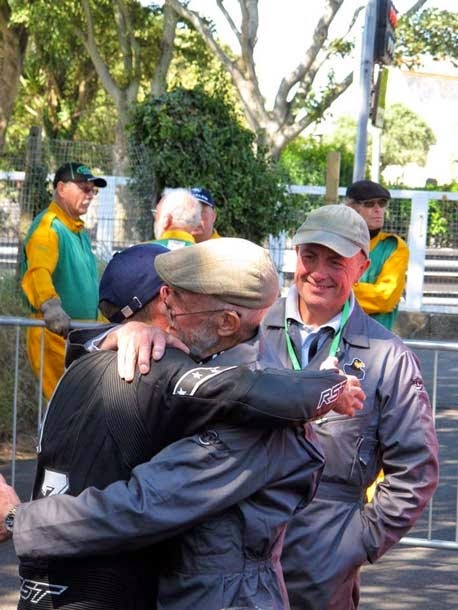 Many thanks to the race team consisting of the Kays, Brian and Bridget, Jason, Tim, Big Mark and the the Isle of Man representative Paul Philipps who afford us all the help and assistance during our vist to the island. Wednesday the 13th November M.C.N gave a preview of the New M.V. It was stated by Giovanni Castiglioni the Boss man of MV Agusta that this is the companies first touring bike. Why don't the present owners, whoever they may be, learn the history of their company. In 1950 Agusta produced a prototype 500cc Turismo for the Milan show, nothing was heard further about its development and was forgotten. However in 1965 an across the frame 4 cylinder 600cc Touring Machine was shown again at the Milan show, this time it actually made production and was sold world wide until 1980. It was the worlds first production across the Frame 4 cylinder motorcycle and MV Agusta 1st touring machine. It never sold in the expected quantities as general public desperately wanted an MV that looked like the red and silver Race bikes. This failure was soley to the bikes hideous looks being the first of its kind, it had no competition but still failed. The photo of the new Turismo Veloce 800 has brought MV Agusta full circle from the sublime to the ridiculous. Not like the MV's original Touring bike this has serious competition from many, many major companies with years of mass producing touring bikes. The article states the bike went from virgin design to the finished production bike in just eight months. You have to admit that they could have used "Lego" blocks and achieved a better looking bike, Hey Ho! If Castiglioni thinks as stated "This is the first touring model this company has ever made but in our opinion it is the best MV Agusta we have ever made!" If this is the future standard of MV Agusta's products save all the agony and shut the company now it has no future. If this is the best, the Lord only knows what he thinks about the previous MV Agusta's he has let loose on the general public. 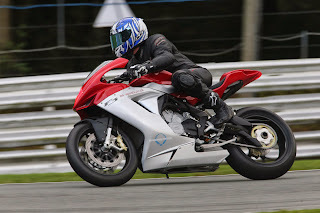 I am not anti MV Agusta my family own and ride a Brutalie, three F4's and will race an F3 next season. We have owned MV's for 35 years. If we any humbly suggest stick to what you know and let your Chinese partners produce the mass produced commuters. On a very much brighter note, Young Marc Marquez did the business and and must have been told "Points make Prizes". World Champion at 20 years with a fist full of world records to boot. Fabulous, Fantastic and very much well deserved. ﻿Finally, if you want to see what Agusta used to race. our 500 MV will be on the I.O.M tourist boards stand at the NEC, Friday till the 24th November. See you there! I watched the documentary on Aryton Senna a few weeks ago, and found myself drawing a parallel of his racing career with that of Marc Marquez, the giant young talent in Moto GP. This thought struck me while watching the Australian GP. Senna had a mantra that if he was to race, he raced to win! During his career he crossed swords with Alain Prost the 'French Professor'. It came to a head when Senna won pole at the Japanese GP and the authorities changed pole to the dirty side of the track, which was the opposite side to the previous year when Frost held pole. During the documentary it was obvious that the head of the governing body, a french man, favoured Prost, much to Senna's disgust. Senna made the statement "If at the start I am at the corner first, I will not give track position to Prost" the inevitable happened and they both crashed out of the race. 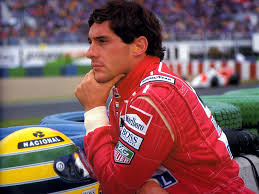 Senna asked the question at the inquiry to the incident " How was it over many years, it was he who was always in the wrong and everyone else appeared to be angels"
Watching the programme, you could not help feeling he was unfairly victimized. 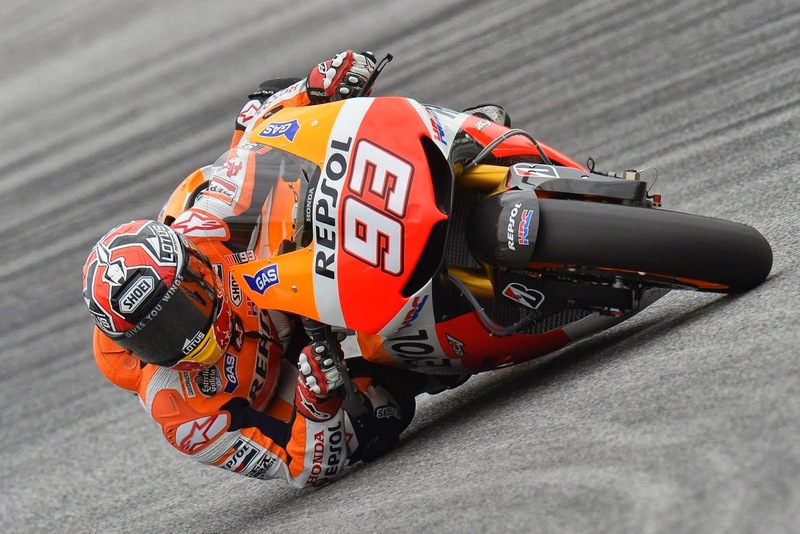 Marquez, a Rookie in Moto GP rode with sensational flare, throughout 2013 requiring only eight points more than Lorenzo to take the title in Australia. He had already been given three penalty points for so called dangerous riding, another would mean starting from the back of the grid. He was alleged to have caused the crash of Pedrosa in Aragon by hitting the traction control unit on Predrosa's bike, caused by slight contact during an overtaking manoeuvre. Marquez was off the track when Pedrosa was high sided, by giving his bike a fist full, expecting the traction control to do his riding and too his surprise...didn't. Like the judgements made against Senna it was stated " If it had been anyone else, it would have been viewed as a racing incident, but seeing that Marc had already two penalty points for so called rough-shod riding an example had to be made". No penalty points for Lorenzo's antics in Sepang. 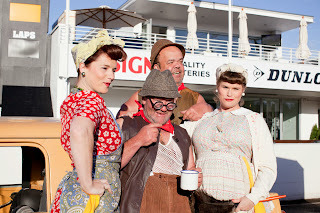 Then we arrive at the Aussie GP. The tyre manufacturer had supplied tyres " not fit for purpose" they were well below the acceptable standard! The organisers therefore ruled that after ten laps, all riders had to pit and change to their second bike. Pedrosa pitted after 9 laps, Lorenzo after 10 laps and Marquez, for what ever reason after 11 laps. His tyres were still on the pace even though worn, but he was black flagged for breaking the new rules. At the Aussie GP there was only 35,000 spectators, the championship all but sown- up. But after this 'Black Flag' only 18 points separated Marquez and Lorenzo, with 50 points up for grabs in the last two GP's, thereby probably ensuring a full house in Japan. As Senna stated " When he started racing there was no politics, you raced to win and the first to cross the line was the winner". 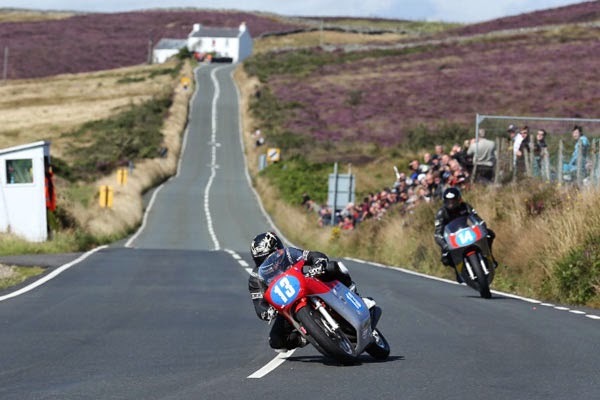 Not so today, both car and motorcycle sport is manipulated by the controlling bodies and the media. 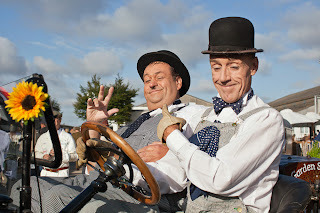 It is done to keep spectators and viewers interested if possible till the last race of the season. After due consideration and deliberation we decided that young Mitch Kay would race an F3 MV Agusta in club events next year. We already had an F3 imported direct from Italy, which had sat in the garage for 6 months awaiting the time and energy to go through the ordeal of obtaining Road Legal documents (Log Book). This is the machine that will have its expensive suit of clothes removed and replica fibreglass fitted. 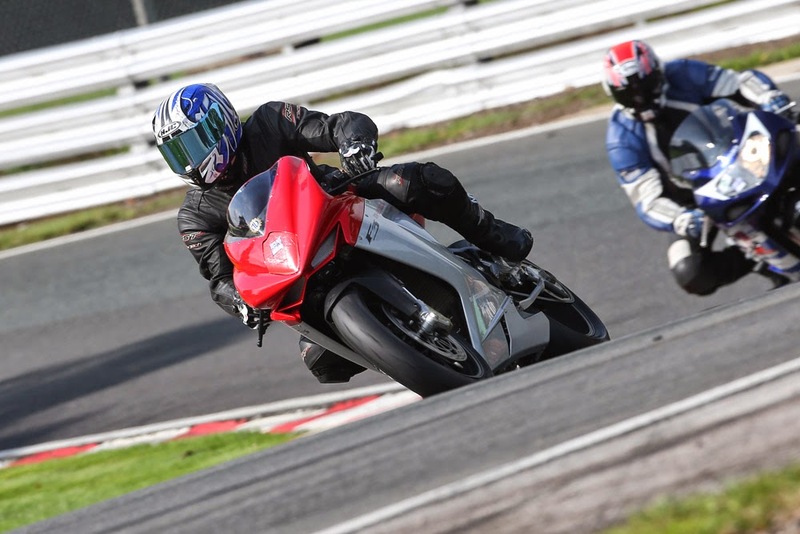 To make sure the machine would be suitable, a track day was booked for Wednesday 25th September. Good value for money as we are allowed up to 8 x 20 minute sessions on the track. 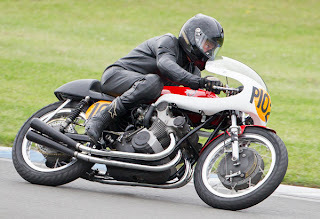 The only two modifications were carried out, one was to fit an Arrow silencer which might have spoilt somewhat the looks of the bike, but it had to be done to meet noise levels. Our other pre-track problem was to overcome the horrendous midrange fuelling. We installed a power commander module set the unit on the dyno which seemed to vastly improve the situation. So off to adventures anew. If we built bikes as accurate as the weather forecast, we would have gone out of business 20 years ago. The forecast was light drizzle until 8am then glorious sunshine. The reality being at 9am for 2 hours continuous heavy rain. I think MV's are rain magnets! However Mitch went out in the rain to do a few sighting laps to learn the track but with standing water, we learnt nothing about handling the bike. So to Plan 'B', walk across the park to the cafe for breakfast and waited for the rain to stop. About 12 noon the track started to dry, so Mitch went out and did a 20 minute session reporting back to base. He started the bike, pulled wheelies over every bump, but when the wheel lifted, the bike violently shook its head. No steering damper was fitted by the factory, so an after market item will have to be found. After doing a couple more sessions, Mitch was really impressed with the torque of the engine. Also, the faster he went the better the bike seemed to handle. The power commander had also sorted the major fuelling problems. It was stated the F3 was or could be a very competitive racing motorcycle, some praise from a R6 Yamaha fanatic. We all look forward to the 2014 racing season, so in the meantime, take care. 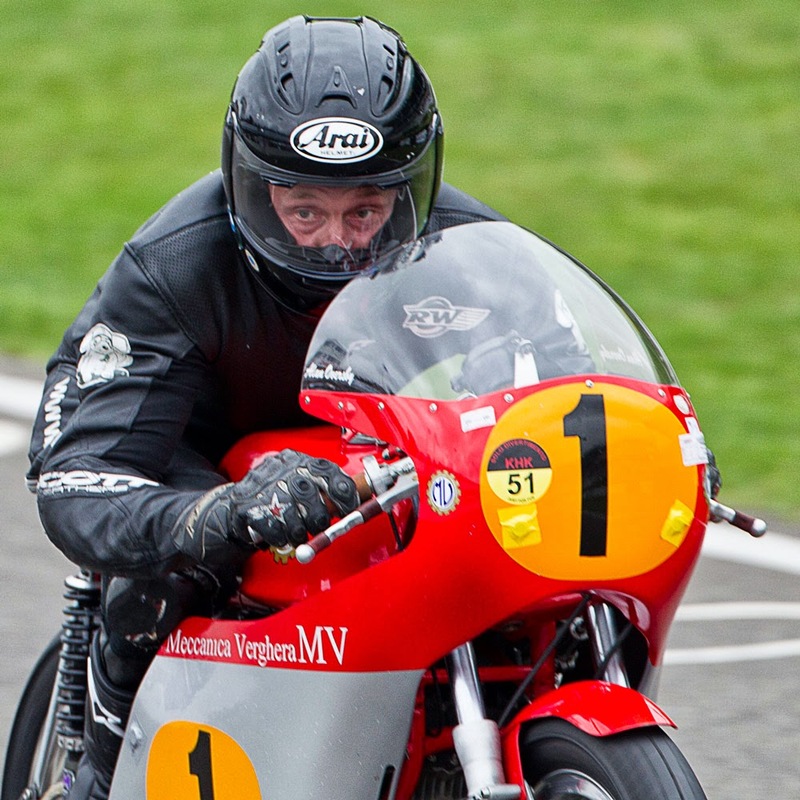 This classic car and motorcycle race meeting must by now be the largest and best organised event on the planet . 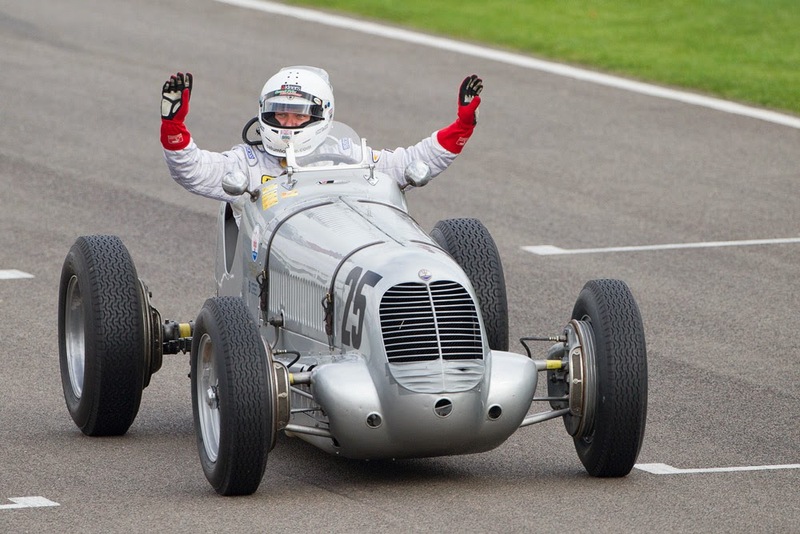 There are cars with the values of £10,000 pounds to 25 million being raced in anger and, every now and then, having major, major crash damage caused by adventures into gravel traps, shunts with other cars or armco's or simple gaps in concentration. 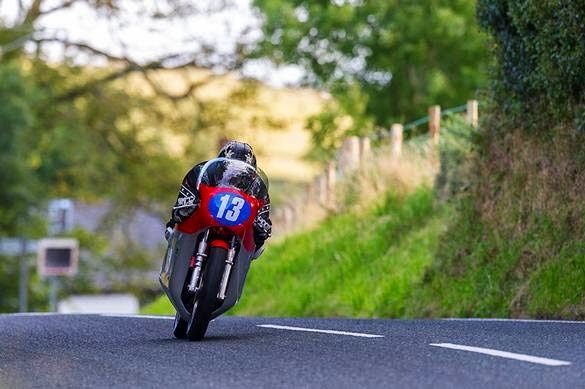 Motorcycles do not command these amazing prices but still have values up to £500,000 and are still raced to the limit, most times faster than the cars even though they have only two tyres worth of rubber to stick them to the track. Surely this type of racing is the purest. 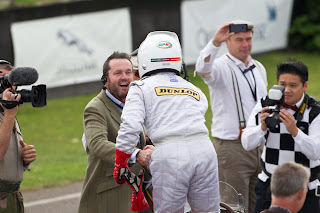 Racing for the hell of it and sod the costs, racing to win for no other reason than the love of the sport. Some have to come first and second is to lose ( I think Black Eagle Racing has this attitude) but not at an event like Goodwood. Winning is not all, there are many other attractions to see and remember long may this event continue. All we who race and attend this meeting should acknowledge the fantastic energy an input of Charlie Marsh and his hoardes of helpers. This event has much to offer its not just about racing. 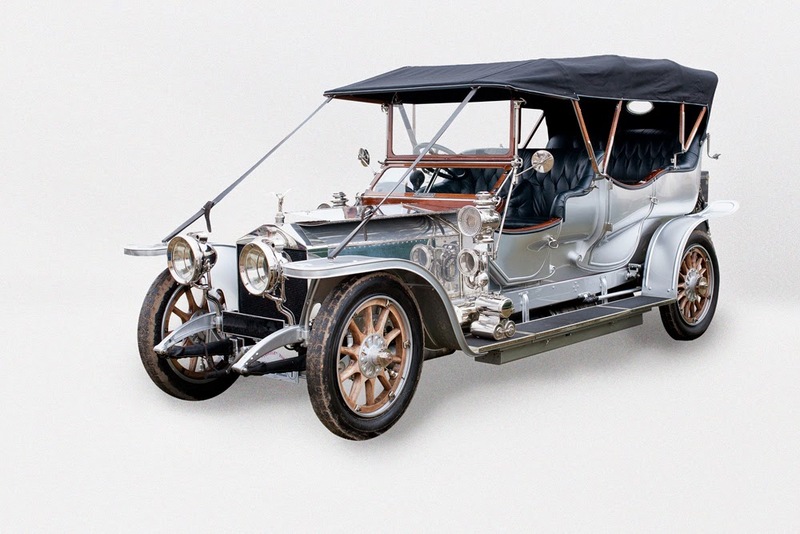 Where else can one see the one-off presentations, exhibitions of all things mechanical, auctions with high quality merchandise and air displays. Simply taking your breath away. Add to that the amazing spectacle of thousands of people in 40s 50s and 60s period costume the event is truly a feast for the eyes. Black Eagle David Kay Racing would recommend this spectacular event to every man, woman and child with only the slightest interest in motorsport. This event just blows your mind away. 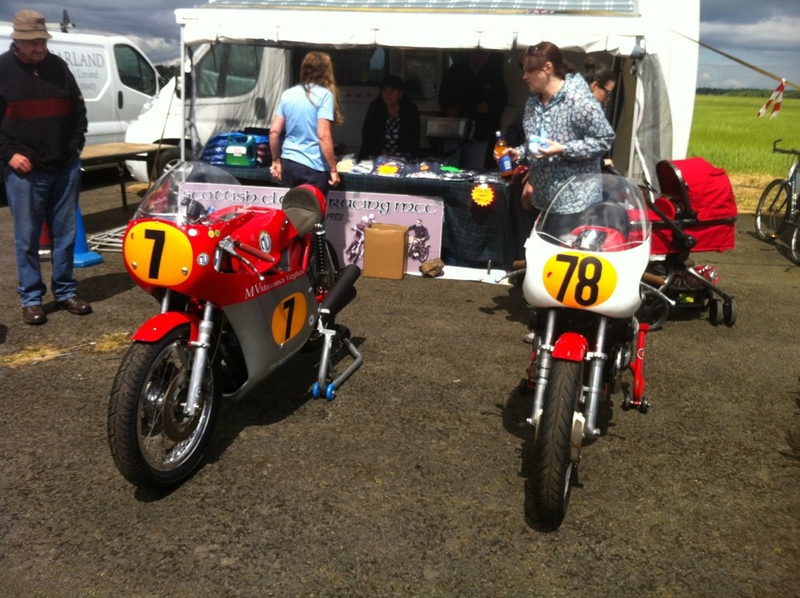 Nearly forgot for our results in the Barry Sheene Memorial Trophy races - see our racing page. The team arrived at the circuit early Friday, weather good, warm with a dry racetrack. 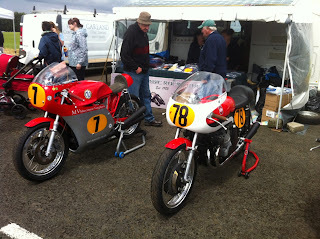 We had taken three Grand Prix bikes, two of which had rebuilt engines. 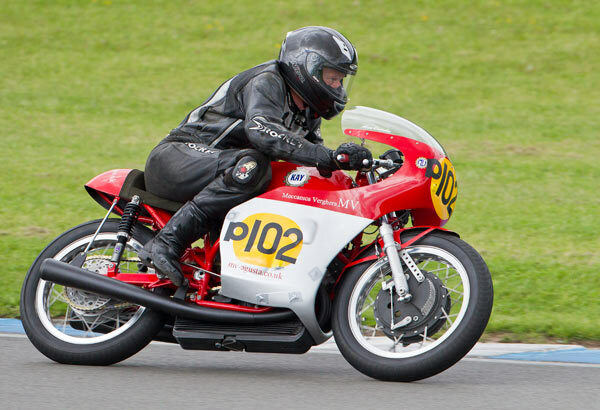 The 420CC MV was on loan to the Black Eagle Racing Team as a spare bike incase of disaster with the 500 MV during practice at Goodwood. Apparently the first time it had seen a race track it had been built of over a number of years from discarded parts, some factory, the true source not being disclosed, so perhaps best not to ask. 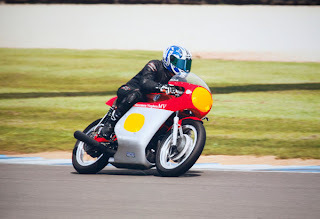 This was how the first 420CC MV was concieved by the legendary MV Agusta team leader Arturo Magni, over a weekend in a grand prix paddock, so it can be said the bike is in a true MV spirit. All the bikes were to be given gentle initial laps to bed-down new parts gentley increasing engine revolutions to their maximum over the course of the weekend. We are slowly developing our website, which is all down to Linda Wright's efforts, believe me she is a wizard with a camera. All the Donington photos were taken with a ultra long telephoto lens, as we were a refused a track side pass. However, some of these photos accompany this blog and shortly Linda will complete a section of Donington photos for the website these will be made available directly from Linda at www.lookingup.me.uk . 1st session Mark on the Gilera, Brian the 420MV and Mitch the 500 MV. All did 6 laps without mishap. 2nd session further 6 laps each. Oils changed at the end of the day and bikes checked - all three seemed ok.
2nd session. 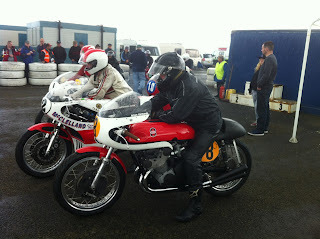 Brian and Gordon really got their heads down and started to put the bikes into race mode. Brian on the 500 MV, Gordon on the 420MV both did 6 laps, over and under taking giving a fine display. However on leaving the track at the end of the session, they were instructed to report to the Clerk of the courses office. Our bikes were not entered into the Classic races, as surprisingly they are not deemed eligible by the classic racing club, so all our track time was parades,which suited us fine as the meeting was being used to prepare the bikes for the BIG,BIG event at Goodwood. Brian and Gordon with heads bowed, looking slightly sheepish,duly stood infront of the clerk of the course who accused them of racing. Brian said he was following Gordon for a couple of laps, Gordon said he was following Brian for a couple of laps,but didnt think it could be construde as racing. C of C was having none of it and pointed to the air ambulance collection box after, cocking a deaf-un again the finger pointed to the box. It cost Brian £20 which is a tidy sum for a Scotch man, but both left the office with a smile on their face. 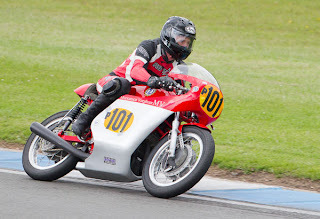 Gordon rounded off the event with 6 laps on the Gilera, all in all a fabulous weekend, a very well orgainsed event hosted by the classic racing club. We had achieved our objectives without mishap and Linda had taken some superb action shots. 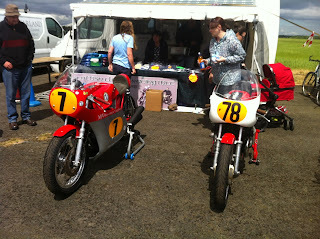 The 420 and 500 GP bikes both did a total of 49 laps around 100 miles each. The 500 Gilera did 24 laps with a total mileage of around 50 miles each. 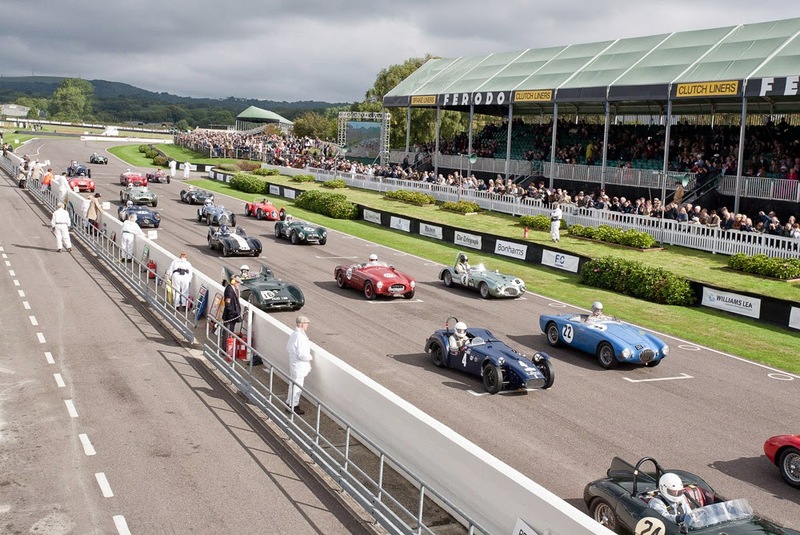 No mishaps one minor oil leak, Looking forward to another spectacular weekend at Goodwood. If you are at the meeting make your selves known to the team and we will make you more than welcome. The trip to East Fortune, Scotland, was wet, very wet. The meeting was cancelled on the Sunday Lunch. We were however able to rectify a fault with the MV. The MV 3 Cylinder was OK for Brian’s 6 or 7 laps, but when yours truly finally had the courage to go trackside on a wet track with heavy rain the engine would not pull above 5 thousand revs. After a lot of larking about with jets and needle positions the fault was with the floats. These are made from two pressed halves of brass soldered together. These were leaking big time and allowing petrol into the float body. On examination the ethanol in the fuel had attacked the solder and, as a by- the- way, ethanol also attacks magnesium, so much for the pasture grown petrol! The World is starving so lets keep the land for crops. On the way home 350 miles of boredom, Mark driving, we got to reading Alan Cathcart’s article on Gilera in Classic Racer. Now here’s a conundrum – how do you get 4-one piece rods on a one piece Crankshaft? Answer – you don’t! The Crankshaft is made in five parts and pressed together after the conrods have been installed. 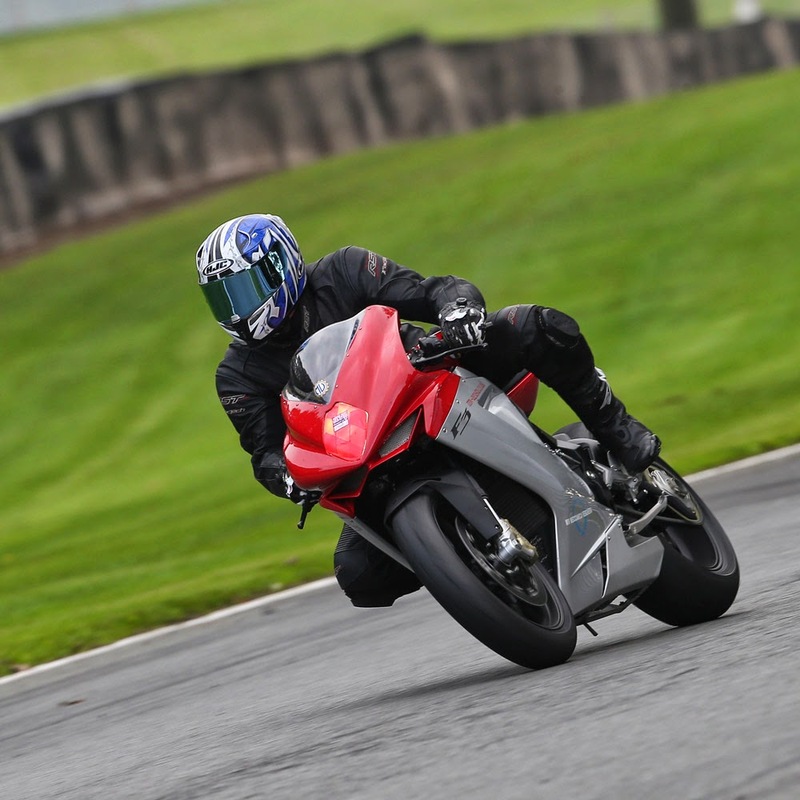 One other little matter – all MCN Road Tests state the handling of the latest MV4 and 3 Cylinder motorcycles is greatly improved by the backward rotating crankshaft as though the manufacturers have just seen the light and had a vision from God. Our Gilera Grand Prix bike 1957 has a backward rotating crankshaft. For the simple reason the chain is on the right and the engine drive socket is fitted to the end of the mainshaft. At the other end of this shaft is the Primary Gear, which is directly driven by the Crankshaft. This also applies when the shaft drive unit is removed from the 4 cylinder Road bikes and replaced by the chain drive conversion. As they say nothing is new in motorcycle engine construction, it’s all been tried before! 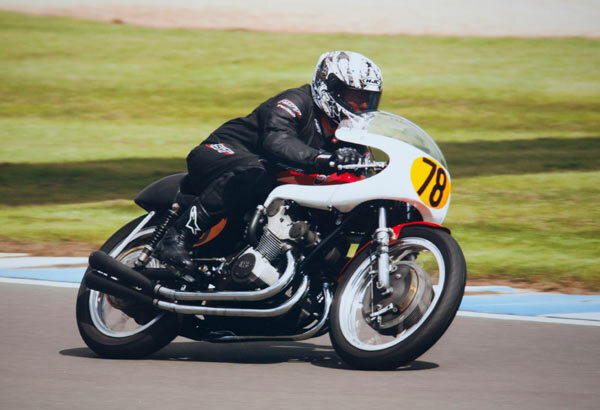 If you are going to the Classic Club Donnington Track meeting in August, make yourself known to us, you are more than welcome.